I had to smile when I read Autum's recent post at Creative Little Daisy... it seems she and I are on the same wavelength these days. As a vacation treat, I bought this cute little kit (from Michael's, using a 40% off coupon, of course!) I thought that perhaps it would help me in my quest to teach myself crochet. I immediately decided that I hated the yarn (icky acrylic) and the plastic hook seemed awkward. So I scrounged through my stash and found some less-objectionable yarn and a metal crochet hook that I have on hand to help me weave in all the little nibbly bits when knitting. And I set to using the kit's enclosed instructions. I can not remember the last time that I did something that felt quite this awkward. Or that I was quite so bad at. But I struggled through it. 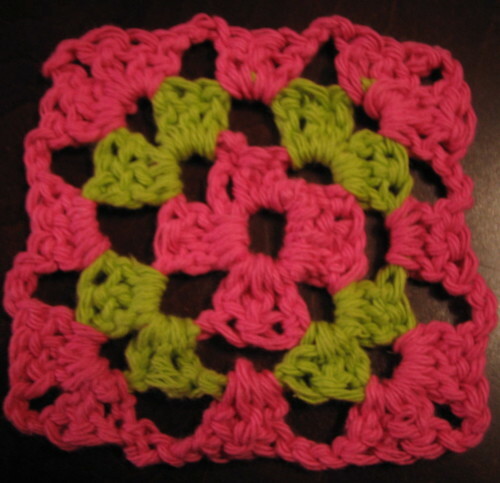 And ended up with what is quite possibly the most awkward and laughable granny square ever. Hey, I'm right there with you. Can. Not. Crochet. At all. But at least you're trying! I've given up completely. Really, yours isn't so bad. I bet with a little practice you'd have it, no problem! Ok this is weird because I was just googling granny square instructions this afternoon!!! I can't believe you guys are all falling like flies. I'm trying SO hard to resist this granny urge -- Autum told me to go for it, but I have too many projects. Once you get the hang of it, you'll love it -- I love to crochet. Anyway, your block looks great -- especially for a first shot! As for potential problems? Not seeing your pattern makes it hard, but I did notice one potential thing. Notice how on the outer edge how it looks like it bulges out a little between your clusters of double crochets? You might have too many single crochets in between the clusters -- try cutting back one single crochet between each cluster. Hope that makes sense. Keep working at it -- you're doing great! BTW, I loved your last little comment about great minds! I think that for your first try that granny looks fab! I think that one of the biggest things with crochet is getting your tension right & that come with practice. I think that winithupoo is right it looks like you might have too many single crochets around the outside. Also once you block it (iron it) it might not be as bad as you think. Keep at it & I think that you will like it! You know, I have no business commenting on this but what the hey! I think Anna (winithupoo) is right, it looks like you have too much between each cluster. The patterns I've seen usually have one chain stich between the clusters except at the corners and then you do 2 or 3 chains depending on the pattern you use. It just looks a little loose to me. Maybe your hook and yarn aren't the right combination?? Also, remember what you were telling me about knitting and blocking? I think the same goes true for crochet. Did you like the kit? Would it be good for a 10 year old? well, you at least got something that resembles a granny square. i just stare and yarn and will it to do something, but that doesn't work. hmph. By the way, I think your first square looks pretty good. At least it isn't a trapezoid. sorry i can't help you with this square. it looks fine to me, but then again, the one i saw further up on your blog looked a little tighter? hope you got the help you needed! now when you have a library question, i'll be first in line to help! loved that winithupoo said y'all are falling like flies for this granny square fad. i love 'em, but must resist the urge to try something else at this point.